WARNING: The following pseudo-review consists of almost equal parts review of the film and discussion of some of the film’s key themes/ideas. The fact that I felt compelled to write so much beyond the scope of a typical review should suggest that Ex Machina is pretty sick. I’m kind of a sucker for movies about artificial intelligence. Combine that with the directorial debut of Alex Garland (writer of 28 Days Later, Sunshine and Dredd) and Oscar Isaac’s significant role, and Ex Machina was a film I couldn’t ignore. Now a day after seeing the film, I’m still struggling to process and catalog all the thoughts and feelings it raised in me… a clear sign that Garland has contributed something special to the science fiction genre. Caleb (Domhnall Gleeson), a programmer for search engine giant Bluebook, has won a contest to spend a week with the company’s visionary CEO Nathan (Oscar Isaac) at his remote, mountain home. But this is no ordinary meet-and-greet/vacation for Caleb; Nathan wants Caleb to perform the Turing Test of Artificial Intelligence on Ava (Alicia Vikander), a new and incredibly advanced AI that Nathan has developed. As Caleb gets to know Ava, he realizes that something far more nefarious is taking place here and struggles to uncover the truth… and who’s behind the lies. The escalating development of AI in our world is getting more and more attention, with some of the great minds of our time (Stephen Hawking, Elon Musk and Bill Gates among others…) cautioning humanity about the potential dangers of superintelligent machines. I can credit the Terminator franchise for my introduction to the dilemma and it’s something that other films (2001: A Space Odyssey and more recently, Her, come to mind) have addressed in one way or another. Ex Machina is like Her in that it’s a much smaller-scale look at existential questions about an individual artificial intelligence but I think it’s a much more satisfying take on those issues (although admittedly focused on different questions). Fundamentally, this is the kind of movie I love to struggle with. Beyond the more obvious questions about reality vs. simulation with regards to artificial intelligence and whether further development of AI is something humanity should even be dabbling with, Ex Machina raises questions about trust and doubt. Yes, there are questions about whether Ava is consciously and independently thinking or if she’s just a great computer program that has an exhaustive list of responses that can be delivered in a convincingly human speech pattern. But this line of questioning is actually really relevant for our day-to-day interactions with/as regular people. If Ava is truly conscious, how can we know if she’s being sincere? How can we really know anyone is being sincere? How can we ever really know anyone? How can we ever really know anything? Maybe this is just my natural paranoia/skepticism reaching its inevitable apex, but how can we tell if someone is who they say they are… or who they appear to be? When a person says they care about you, what can they do to truly, beyond any modicum of doubt, prove that they’re being honest? Is risking their life for you enough? That could be an indication, but who knows if they aren’t just playing the long game? It’s a deeply disturbing and fascinating line of thinking and one that I can’t help but be drawn to. That’s one of the reasons that Christopher Nolan’s Memento is in my top 3 favorite movies of all time. What is real and what is just us/them lying to ourselves/us? At a certain point, one has to accept that just about nothing is known and that if we’re to accomplish anything or go anywhere, we simply need to have blind faith that maybe not everyone has ulterior motives (that ended way more tritely than I intended… apologies). But then again, in Ex Machina that’s the exact kind of leap that Caleb takes at the end and he’s punished for it. The end of the film is really what I had a tough time wrapping my mind around. So many movies I’ve enjoyed all the way through have severely ruined their legacies by having depressingly uninspired endings, but fortunately Ex Machina doesn’t fall into this trap. At the end, after having “proved” to Nathan that she’s a true, artificial intelligence by her demonstrated ability to convince Caleb that she loves him, she completely abandons Caleb. And this isn’t by any means an accident. As Ava makes her escape, she clearly acknowledges Caleb’s presence before deciding to leave him to die alone in Nathan’s lab/prison. Even with her staggering ability to demonstrate human qualities in manipulating Caleb (Nathan has a pretty cynical worldview if he considers that enough to qualify as her possessing human-level intelligence), she still lacks some of the most beautiful of that bunch: compassion and mercy. Yes, she’s been mistreated and abused by Nathan, but she’s either unwilling or unable to treat Caleb (who’s been pretty decent to her by most standards) as if he were an independent human being, deserving of better treatment than Nathan. Even for all her advanced intellect and apparent warmth, she is still a machine. What’s particularly troubling about the way she leaves Caleb is that she doesn’t articulate any animosity for him… she’s simply indifferent. That may not be worse than a malevolent AI like Terminator’s “Skynet”, but it sure isn’t a whole lot better. I can’t help but mention the movie’s visuals. While it doesn’t have huge, effects-laden spectacle, it’s a gorgeous imagining of a realistic near-future world. I doubt I’m the only one who’d want to live in Nathan’s house, especially given the spectacular surrounding landscape. 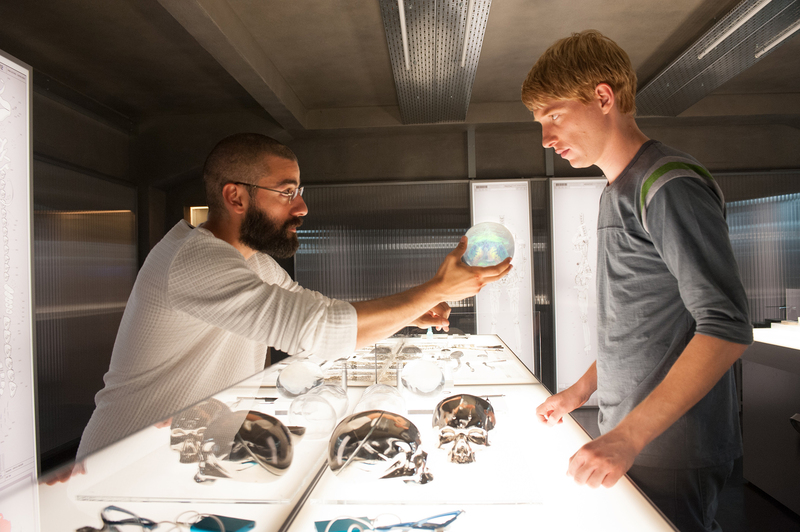 Ex Machina isn’t a particularly plot-heavy movie. It certainly wrestles with complex issues, but the actual events of the story are pretty straightforward. But the movie manages to pack loads of appropriate thought and philosophy around that relatively simple and clean plot, which carries the whole experience further than some movies that struggle with convolution. I’ve been fascinated by Oscar Isaac ever since I saw him in Inside Llewyn Davis. While I had seen him in a couple of other roles, that was the performance that really caught my eye. And as the brilliant, mysterious and egomaniacal Nathan, Isaac shines, constantly exuding a cold, subtle menace that bubbles towards the surface over the course of the film. He captivates in every scene and provides one of my favorite moments of the film: a strangely disturbing and tense little dance interlude. Alicia Vikander delivers another of the film’s strong performances, convincingly portraying a role that can’t really be modeled off of anything that exists in the world. But she masterfully balances playing a woman and a computer, without one of those major, contradictory facets overpowering the other. Basically, it’s obvious that she isn’t a woman (to be fair, the visuals help in that department) but it’s also pretty clear that she isn’t just a computer. Ava as a character is more than the sum of her parts and Vikander embodies that. Domhnall Gleeson rounds out the major players (there are really only like three speaking parts in the whole movie), giving an unusual strength to the “lone nerd” archetype (that may not be an actual archetype). The casting as a whole was excellent and a large reason that the film turned out as well as it did. 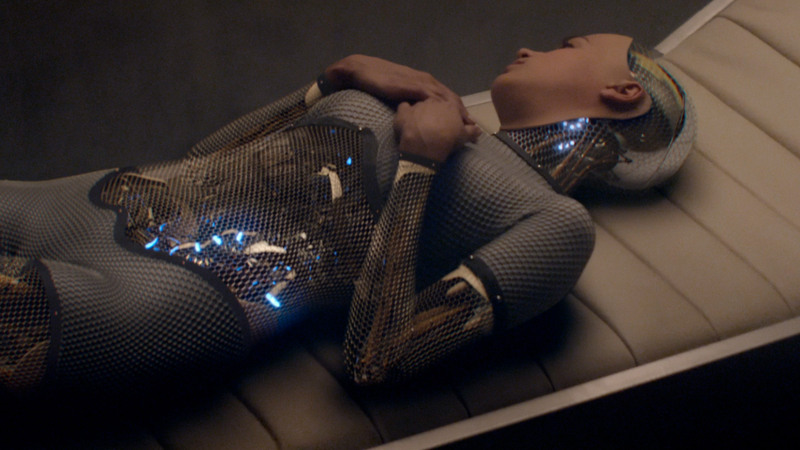 Ex Machina is a beautiful, thoughtful and deeply unsettling film. It tackles relatively familiar concepts that become more and more relevant to our world each passing day with intelligence and wisdom but doesn’t necessarily attempt to answer the countless questions the topic raises. The film represents a microcosm of the larger question about the risk/reward of developing true AI. As Nathan and Caleb both learn the hard way, the allure of having machines as our equals and companions in the short-term may not be worth the lasting and inescapable danger. And with the way things are going, it seems like we might be doomed to find out the hard way as well.